Currently listed by Texas Guitar Ranch this Custom Mas Hino built Atelier Z Strat was owned by session artist Sherrod Barnes. So besides its master luthier heritage, this guitar also has serious touring & hi-end gig mojo with the likes of Whitney Houston, Roberta Flack & others. You can see/hear it in action at a live gig with Vivian Sessoms above. "Not well-known in the US, Atelier Z is one of Japan's top custom instrument builders. It is run by the brother of famed luthier Mas Hino, who worked for Pensa/Suhr and Alleva-Coppolo in the US, Atelier Z in Japan, and now has his own shop in New York. This guitar was custom built by Mas when he was working in Atelier Z's shop for Sherrod Barnes, who played this guitar with Whitney Houston, Roberta Flack, and many other Grammy award winning artists. The neck pickup is a Seymour Duncan ’59, and the bridge is a Bare Knuckle Stormy Monday (UK Handwound). 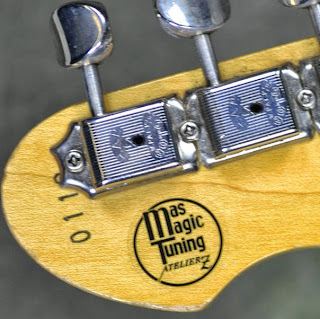 Not sure what the single coil is, it has a label with 1 on it, but it’s a handwound pickup. The guitar has moderate fret wear up and down the neck, but frets well without buzzing or issues. It is worn as it has toured the world..."